Allyson McHardy’s mezzo voice has been described as radiant, dusky, incandescent, and sumptuous; her presence on stages around the world as noble, spellbinding, and seductive. 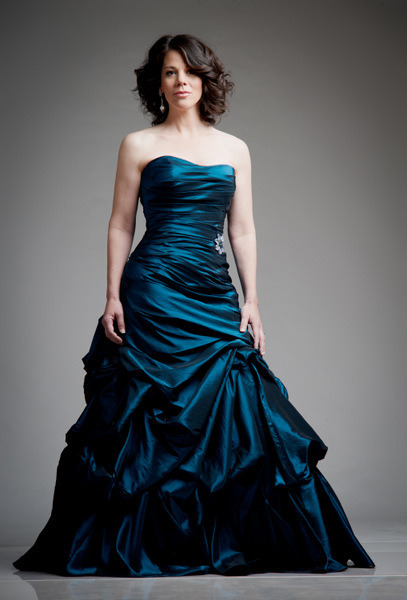 Her varied opera repertoire encompasses roles from Handel to Verdi and from Saint-Saëns to Heggie. Allyson embraces a range of orchestral and recital repertoire from early to contemporary music, including Mozart’s and Ligeti’s Requiems, from Bach to Berlioz and Mahler, and new works such as the song cycle Enchantments of Gwendolyn written for her by Marjan Mozetich. In the 2017-2018 season Allyson will perform Mahler’s Symphony No. 8 and Beethoven’s Symphony No. 9 with L’Orchestre symphonique de Montréal, Smeton in Anna Bolena for the COC, Ryan’s Requiem with the Toronto Symphony Orchestra, and Messiah with the Kansas City Symphony. Her 2016-2017 season included a debut with the Beijing Music Festival in the Aix-en-Provence production of Britten’s A Midsummer Night’s Dream. The spring sees Allyson take on the role of Julie Riel in the Canadian Opera Company’s new production of Harry Somer’s Louis Riel at the Four Seasons Centre in Toronto, in Ottawa with the National Arts Centre Orchestra, and in Quebec for l’Opéra de Québec, presented as part of the celebrations surrounding Canada’s 150th Anniversary. She also appears with the National Arts Centre Orchestra in Mozart’s Requiem, and L’Enfant et les Sortilèges with the Seattle Symphony, as well as later in their season for Ligeti’s Requiem. Recent highlights include appearances as Suzuki in Madama Butterfly with both the Opéra de Montréal and Vancouver Opera, in Britten’s A Midsummer Night’s Dream at the Aix-en-Provence Festival, Donizetti’s Lucrezia Borgia in St. Gallen, Switzerland, in the Canadian Opera Company’s Roberto Devereux, Handel’s Alcina with Opera Atelier, as Sister Helen Montréal’s Dead Man Walking, in l’Opéra de Paris’s La Clemenza di Tito, and Amadis de Gaule at the Opéra Comique, as Juno/Ino in Handel’s Semele with the Canadian Opera Company, as Dijanira in Handel’s Hercules with Tafelmusik, Marchesa Melibea in Rossini’s Il Viaggio a Reims at the New York City Opera , as Adalgisa in Norma in Warsaw, and as Isabella in Rossini’s L’Italiana in Algeri with the Calgary Opera. She has appeared with major orchestras across the globe including performances of Ligeti’s Requiem with the Royal Concertgebouw Orchestra, Mahler’s Das Lied von der Erde, Mozart’s Requiem, Bach’s Magnificat, Beethoven’s Missa Solemnis, and Elgar’s Dream of Gerontius, among many other works. She also recently took on an innovative collaboration with the Alberta Ballet, performing Requiem, choreographed by Jean Grand-Maître and set to the music of Mozart’s masterpiece. Allyson’s discography includes the 2014 JUNO-nominated Handel’s Orlando with the Pacific Baroque Orchestra and Alexander Weimann (ATMA). Other CDs include the JUNO- and ADISQ-nominated Caldara’s La Conversione di Clodoveo, Re di Francia (ATMA) in which she performed the title role, Bellini’s Norma with the Warsaw Philharmonic (Philharmonia Narodowa), two works by Harry Somers – Serinette and A Midwinter Night’s Dream (Centrediscs), and Ukrainian music by composer Mykola Lysenko in a six-disc collection by the Musica Leopolis label.